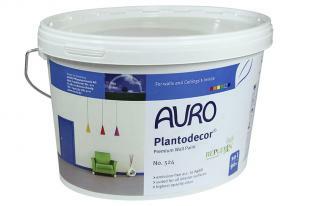 AURO Premium Eco & Natural Emulsion Interior Wall Paint. The Term"Premium“ is appropriate for this new product because it enters the market as the world‘s first ecological wall paint without any technical limitations. Can be applied by brush, roller or sprayed on. Many colours available, or tint your own! The new premium wall paint combines all technical features of a conventional wall paint and AURO’s consistent raw material philosophy. The breathable wall paint is open-pored (sd value < 0,05), low-odour and emission-free according to the strict AgBB evaluation scheme. Creates a feel-good indoor climate. Mix your own desired colour tones with the Full-shade tinting colours. 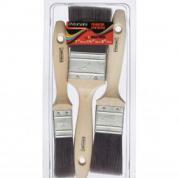 Little dripping and splashing, can be easily applied by brush, roller or with spraying equipment. Even dark or patterned surfaces can be covered white quick and easy: Plantodecor® impresses with a top opacity of 99,5 % (opacity class 1). Plantodecor® boasts a top-opacity of 99.5%. (Opacity class 1). Replebin® is a legally protected development, a result of AURO’s own research. The biogenic binding agent REPLEBIN® guarantees professional product characteristics, e.g. high abrasion resistance (class 1), little tendency to drip or spatter, zero emission, tested according to the highest standards (AgBB, TUEV) and therefore especially recommended for living areas. The product is suited for all indoor surfaces, it adheres to old and new plaster including lime plaster, dry lining boards, previously painted surfaces even on latex (vinyl) paints and other "difficult“ substrates. This low odour wall paint has a pleasant smell and an excellent hiding power. It can be tinted with the Full-shade tinting colours no. 330.